Light cured hybrid composite for anterior and posterior restorations. Excellent handling characteristics allow easy placement. Contains: 18 x 0.20g capsules. Contains: 9 x 0.20g capsules. 3M ESPE Z100 Restorative is an all-purpose, light cured composite with zirconia filler particles averaging 0.6 μm in size. Editors of THE DENTAL ADVISOR placed over 1,000 restorations beginning in early 1992. Many of these restorations have been monitored and recalled periodically with the findings published in THE DENTAL ADVISOR. 129 restorations that were placed in 1992-93 were recently recalled after at least 15 years in function. 104 restorations were in posterior teeth (81%), and 25 restorations were in anterior teeth (19%). Among the recalled restorations, 33 were one-surface restorations (26%), 88 were two- and three-surface restorations (71%), and 8 were four-surface restorations (3%). 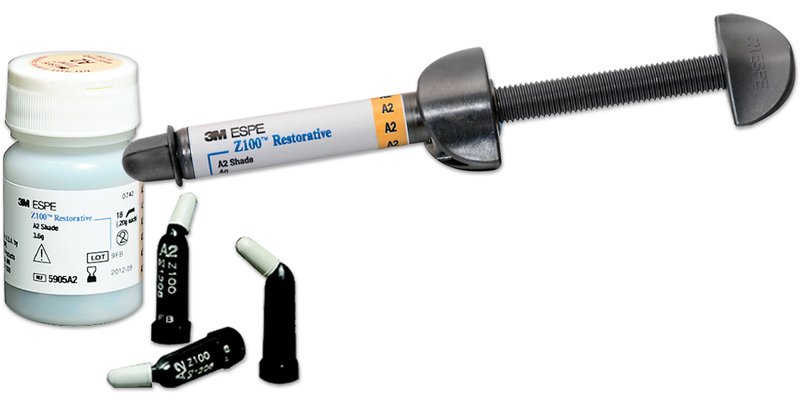 Most restorations were bonded with 3M ESPE Adper Scotchbond Multi-Purpose Dental Adhesive. The restorations were evaluated on a 1-5 scale: 1 = poor, 2 = fair, 3 = good, 4 = very good, 5 = excellent. 125 of 129 restorations exhibited no fracture or chipping (81%). The remaining 19% showed some minor chipping. None of these restorations required replacement. Very little shade change took place over the 15-year period. 72% of the recalled restorations exhibited excellent shade match. About 28% showed slight discoloration, some of which could be due to water sorption. Marginal discoloration is likely related to the bond of the composite to the tooth. In most cases, the composite was bonded with a 4th-generation bonding agent. Some of the discoloration at the margins was due to chipping and it was most visible in patients who smoked. 81% of the restorations had no discoloration at the margin. The wear resistance at 15 years was excellent. In most cases, wear was almost undetectable, either with an explorer or an intraoral camera. The low wear rate of Z100 is consistent with the normal amount of wear observed on tooth enamel and amalgam restorations. None of the restorations were replaced because of excessive wear. In fact, in 84% of the restorations, the wear was undetectable visually. 3M ESPE Z100 Restorative performed exceptionally well over the 15-year monitoring period in both the anterior and posterior regions. The restorations had long-lasting esthetics, minimal wear and negligible fracture or chipping. This composite received a 96% clinical rating. Patient satisfaction was very high. None of the Editors of THE DENTAL ADVISOR would have predicted such a positive outcome of Z100 restorations 15 years after placement. The clinical performance of Z100 during this period met or exceeded all expectations. Even though many new composites have since been introduced, Z100 has proven itself to be in a class of its own. Editors’ note: the data for this study is drawn from the patient records of Dr. John Farah, who has diligently maintained the long-term data necessary for this study. All data has been reviewed, discussed, and debated by The Dental Advisor editorial board before publication. In more recent years, additional dentists have become involved in maintaining rigorous long-term records of dental material placements; currently, 8 dentists are involved in the Z100 project, and the number is growing as The Dental Advisor moves toward a new tracking system.